I take off my headphones and hear the sound of clicking. I'm in Irvine, California, among a room-full of game journalists playing the Diablo III beta. And we're all clicking furiously - attacking, looting, moving and repeating. Otherwise it's deadly silent in here. Everyone is intent on getting the most out of this slice of a game that many of us have been waiting eleven years for. So there's a lot of note taking going on. I, myself, take copious notes as I start playing, noting the name of each zone my female Barbarian stumbles into. When I approach the barred gates of New Tristam and encounter my first NPC I write in my Moleskin that I fought off waves of the dead. There's a scribble that says, "Good V.O." because, indeed, the acting feels solid in Diablo III - a mite better than you've heard in World of Warcraft. And then something mysterious happens to my notes -- they begin to taper off. Inside New Tristam I find a city under siege. The mayor is trying to skip town. The village tavern is full of the infected. Those sad souls soon turn and I'm left to cut them to shreds. I meet Leah, adopted niece of Deckard Cain, the stalwart mystic who has been aiding players in the battle against the dark lord Diablo since day one. Deckard has gone missing. The old ruler of Tristram has been enslaved by Diablo and transformed into a bony monstrosity. And it's my job to find the old man, smite the Skeleton King and return some semblance of order to New Trisram. And that's where my notes end. I got sucked in. Never mind that my mind had just been reeling with the news of the real money auction house, not to mention the issues of the game's always-on Internet requirement and lack of support for mods. Forget that I was buzzing on the caffeine of two Mountain Dews, trying to predict the Internet shitstorm that would ensue when gamers got news of all those bullet points. To hell with all that because for the next three or four hours Diablo III did exactly what it was designed to do. It broke the laws of nature and transported me four hours into the future. And as the game warped time, I had a damn good ride. My first run through the beta took less than two hours. My lady Barbarian Snu Snu talked to everyone. She sifted through loot, searching for the best axes and armor to equip. I spent a lot of time thinking about Snu Snu's skills. Rolling through ten levels of progression there were lots of interesting decisions to make. And none of them involved trying to make sense of a skill tree. At Blizzcon less than a year ago Blizzard showed off a streamlined tech tree for Diablo III. This year they chopped the whole thing down. Every time Snu Snu leveled up she gained access to skills like "Cleave" and "Ground Stomp." Soon I had four or five different abilities, but only three slots to equip them in. I put a lot of thought into which combo would work well for my warrior. I tried jumping into the midst of battle with "Leap Attack," working my fury up with my spammable "Bash" then unleashing my rage with the "Rampage" buff. But when it came time for a big boss fight I found that I wasn't mitigating damage enough to last long enough to down my foe. After death (and a ten percent durability penalty) I swapped out my skills for "Ignore Pain" to reduce hit point loss and "Ground Stomp" to slow the adds who were harassing me while I whaled on The Skeleton King. And that was just my first play of the beta. Waiting for friends to join me I rolled a Witch Doctor to learn the ins-and-outs of that class. Jay Wilson, the game's director, had called the Witch Doctor a pet class, and I did spent a lot of time summoning allies to do my killing for me. Poisonous frogs hopped haphazardly towards my enemies, friendly shamans turned them to chickens and my pack of zombie dogs tore apart any creep that got in my way. Exploring the beta a second time I discovered mini-dungeons I hadn't noticed before - probably because they hadn't been there before. 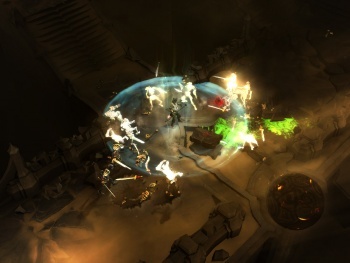 Diablo III makes tweaks to the maps every time you play just to keep you on your toes. I noticed the most when I joined three other players to take on The Skeleton King. My friend invited us to a match that began upon entry of the Tristram Cathedral. At the time I didn't realize something was up, but my group kept getting lost - following passageways to dead ends and roaming the map aimlessly. We were trying to follow the route we'd taken during our last play but the randomized map had turned us around. When we finally got to The Skeleton King's lair our party got split up. Two of us went inside while the other two accidentally refused a pop-up widow that appeared when the boss fight was about to begin. This seemed like a disaster at first, but the two players in the fight stoned back to New Tristram then teleported to us by clicking on our banners in town. We all entered the boss fight together and murdered The Skeleton King as we were destined to do. Gold and weapons fell from his body and a message popped up on screen telling us that we'd completed the Diablo III beta. We were done, but my first impulse was to play just one more time. Argue all you want about DRM and the ethics of micro-transactions. Just know that when the time comes for the Diablo III beta to kick off you're going to have way fewer people to preach to. Just like me they'll all be sucked in.